her camera, as water washed the Western Wall. Milton Gold is the chair. ment of vital public services. collapse for lack of orders. tions are now over $4,000,000. speaks on behalf of Israel. SJKnSiCentury Villagephonathon on Feb. 10.
initiate the tradition of giving. about the needs of the local Jewish population. that capacity for four year. tion in mcfre than 45 organic. For more information contact Ronni Epstein. It rect. West Palm Beach. For more information call (the Federation office 832-2120.
munity to join us in this effort. tied to the volunteers' chairs." 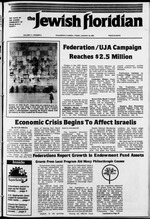 into the larger, dominant U.S.
ation of Palm Beach County-United Jewish Appeal campaign. nesday, Feb. 13, 11:30 a.m. at the Garden Club, Palm Beach. Division director, at the Federation office 832-2120. 501 S. Flagler Dr., West Palm Beach, Fla 33401 Phone: 832 2120. Jewish Flondian does not guarantee Kashruth of Merchandise Advertised. century. It was not until the ju Yiddish, he added. schoars started coming to the hom^ P^ and ,ed . ^ :u H.h,?.OM0 Seattle. Today Seattle has the established a speakers bure? never get organized," he said. ASF "is not in competition! Rosen, Rachel and Aaron Rubinstein, Jndy "
scnimmel, and Saerri and Rabbi Steven Wernmnn. Roth, Israeli mother and Holocaust survivor. reception Congregation Aitz Chaim board 10 a.m.
Women's American ORT Royal art auction 6:30 p.m.
Jewish Communal Workers Seminar Meeting 8:30 a.m.
Familv and Children's Service board 7:30 p.m.
Burrows is chairing the dinner. 495-1719 or Phyllis Siegelman 689-9032 in the evening. tunity to form quality relationships with special children. are invited to call Bonnie Altman at 689-7700.
call 689-7700 to receive it in the mail. child. Fee: JCC members $35 non-members $45. Playland for ages 12-18 months. Maximum 12 children. cooking, creative movement, physical and dramatic play. Fee: JCC members $85, non-members $95. of the 1984-85 school year. any other group in the world." West Palm Beach, at 6 p.m! news. First, the good news. known as "Ivan the Terrible"
insights are of a high order. war criminals came here . writings which have made it. the first DP Act did. some of those (DP Act) visas. and even after the Holocaust. that prove too much for him. when in fact he was neither. when credit is not quite due. that the aide to the U.S.
criminal who came to the U.S.
exposures are cited by Ryan. elected chairman of the board. people and the State of Israel. The history of Flagler Federal coincides with th. million to $1 billion prior to his death in 1983.
who brought the railroad to West Palm Beach, Miami and. comprised of individuals who have u.
stein, Covin, Beer and Company. Jewish Education and of the Federation1! leadership in two Palm Beach County." the county and all South Florida. 1700 Palm Beach Lakes Blvd. of the man in whose memory it is known. schools, parks and houses of worship. most desirable places to live, work and play. a Flagler Federal IRA now? your future on the right road. emergency medical, blood and ambulance services. Hilton Hotel, Australian Avenue, West Palm Beach. Max Willner in "The Memories of the Yiddish Theatre." Rosenthal, Joseph Berk and Arthur Slater. talent. A mini-lunch will be served. Bernice Fink or Mary Rodd. Village Hall. Tickets are S3 in advance as seating is limited. Opportunities for the Senior Citizen." call Lee Levine or Ruth Muckler. panied a piano by Dora Rosenbaum. Robert S. Levy, Robert E.
THURSDAY, JANUARY 24th, at 7:30 P.M.
TO SEE OUR CAMP FILM. TO MEET THE DIRECTOR. q what it terms "Israeli crimes"
;now of anything like them. coto.. pan. and taanc you ra .. -aa i.
of the American Jewish Congress. gram, featuring tours to 34 countries. ference," refreshments and door prizes. world. Truly, a World of Difference. D We ptan to come to the Travel Presentation. the navy, citing budget cuts. seeks to hold down real wages. war criminals entered the U.S.
held anomalies of the author. that Barbie entered the U.S.
a major war with Jordan. and FBI usage are indicated. first on a tourist visa in 1947. America and the Far East. died admitting his Nazi past. wing was "hired" by "U.S.
cov entammmmmt "mm o *"
Lim ona coupon par purcnaaa EXP MARCH 31. ! David Schwartz is an attorney. Rabbi Avrom L. Drazin, Cantor Arthur R. Rosenwasaer. Cantor Earl J. Rackoff. Sabbath services, Friday 8 am. Cantor Elaine Shapiro. Sabbath services Friday 8:15 p.m.! Dardashti. Sabbath services, Friday 8:30 p.m.; Saturday 9 a.m.
Jupiter High School. Military Trail, Jupiter. Mailing address. Mi. oiL3, yKLftS?1' FL 32961-2113. Rabbi Richard D.
13000 Paddock Dr., Weat Palm Beach. Mailing address: P.O. p.m. Kabbi Steven R. Westman. Phone 793.2700. KS ,"5"; ^ W^Wagton Rd., at Southern Boulevard. kning, Jan. 25, 8:15 p.m.
conducted by Rabbi Avrom L.
Drazin and Cantor Arthur B.
kver 280 members belong to the actively growing temple. aanne. 85, of 2601 S. Ocean Blvd..
lacob. 80. of 3500 Sprlngdale Blvd..
Edward H 90. 2880 Emory Drive E.
Computer terminal operator for social service agency. Some accounting background. Excellent benefit package. Stuart are parents of Rachel. Aaron, 6B. of West Palm Beach. flv now. An offer this gcxxi won't last forever. deluxe Laromme Jerusalem Hotel, the Tel Aviv or Jerusalem I lilton. $111. * EL AL GIVES YOU EILAT.
. i-pn, i .... ,l..i.,|, -it N, >uttUfMfl MdpWCfMH'ilfmMdlnp' I Allhk-Ir..ml s r>> MAui I'no Mjhtrt I [...h^n*,- Wlthnift Hub. < ri.i,. thru L 5 S3.) The deluxe Sonesta Hotel is also available for $144. Now you can haw it all. Israel and Cairo in one magical trip.